Carl Richard, previously a stock broker, drew this simple picture as a way explain what most call the Behavior Gap. 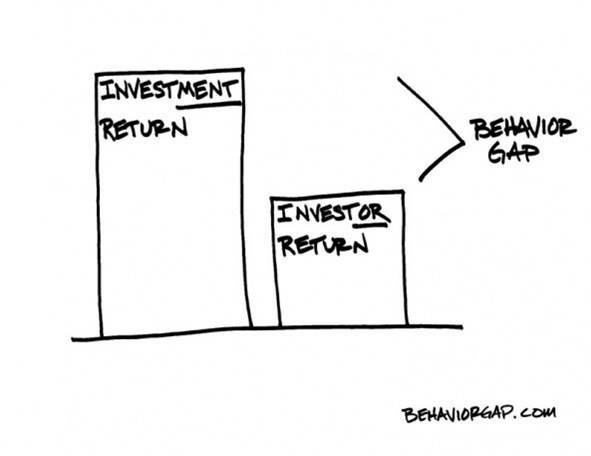 The Behavior Gap is the difference between Investment returns and Investor Returns. We feel it is our job to help clients close the gap. First of all, what causes it? Emotion! Investors tend to buy high (greed) and sell low (fear). Many investors will do this with the same investment multiple times and at the end of a longer term period, the investment undoubtedly performed better than the investor. 2. KNOW YOUR COMFORT LEVEL – can you handle a sudden 20% drop in price?